Below, we describe how to move the default Magento 2 security to a completely new level. Although there are tons of extensions designed to turn the platform into a safe place, we’d like to draw your attention to CyberSource Secure Acceptance by Magedelight. 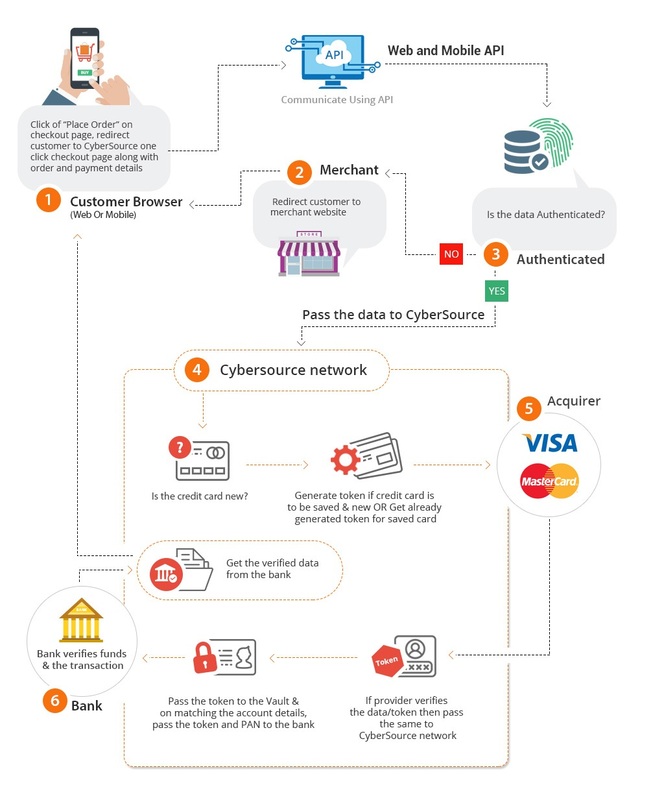 CyberSource is a system designed to manage ecommerce credit card payment processing with the highest possible security level and Magedelight knows how to connect both platforms together. 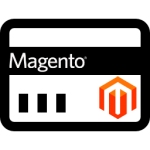 The core benefit of the CyberSource Secure Acceptance Magento 2 module is the ability to review orders and send payments outside Magento 2. As a result, work on the merchant website is reduced, and you get a perfect opportunity to eliminate fraud transactions. Although it seems that such improvement is less user-friendly than the default solution, we don’t think so. Indeed, it not only increases the security level, but also improves shopping experience by allowing customers to save their credit card details on the secure server only. Furthermore, card details can be managed in a customer account. As for the aforementioned multiple invoices functionality, it can be used for splitting a single order that contains several items. 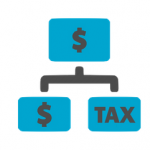 As a result, each item can get its own invoice that will be processed separately. If you are wondering how refunds work in such a complex system, don’t worry about their complexity: everything’s the same from the perspective of backend management. Although all payment data bypasses merchant network, CyberSource informs whether or not the transaction was successful. Please note that in order to implement this Magento 2 payment gateway integration, you need a CyberSource customer account. 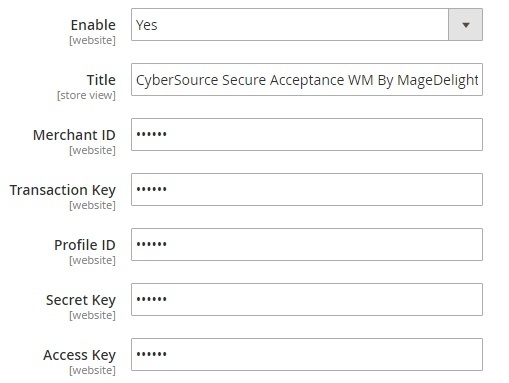 Let’s see how to configure the Magedelight CyberSource Secure Acceptance Magento 2 extension. Under Stores -> Settings -> Configuration -> Sales -> Payment Methods you can find a Magento payment gateway list. Find a section called CyberSource Secure Acceptance WM By MageDelight. Enable the gateway and type its name. Next, specify Merchant ID, Transaction Key, Profile ID, Secret Key, and Access Key. Type Gateway URL and test URL, enable test mode, and select Payment action (Authorize or Authorize and Capture). 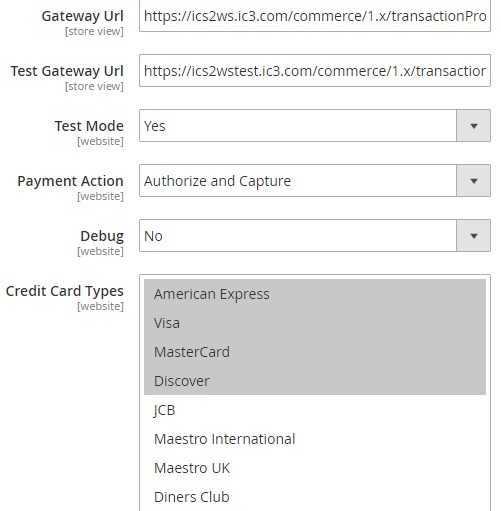 Enable/disable debugging and select supported credit card types. 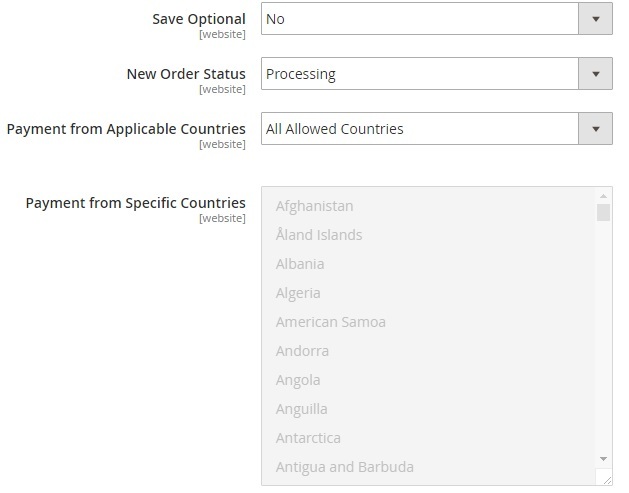 Decide whether to save optional or not, select a status for a new order (Processing or Suspected Fraud), and decide what countries to accept payments from. 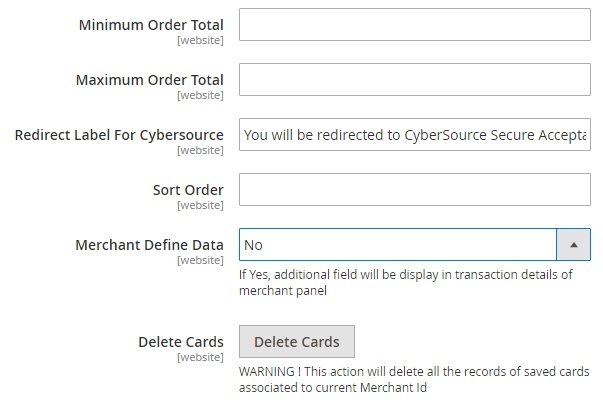 Besides, you can specify both minimum and maximum order total, type a redirect label for CyberSource, specify a sort order for this Magento 2 payment gateway, configure merchant define data, and delete all records of saved cards associated to the current Merchant ID. To view all credit cards saved by a customer, go to Customers -> All Customers and select any registered user. 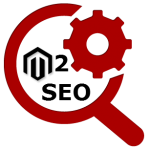 The Customer Information section contains a new tab – Saved CyberSource Cards. There is a grid under the tab that shows card holder, number, and type (Visa or MasterCard). Under Sales -> Operations -> Orders -> View Order -> Payment & Shipping Method, you can also view payment details related to CyberSource: credit card type and number, processed amount, transaction ID, AVS response, Merchant Reference Code, currency. 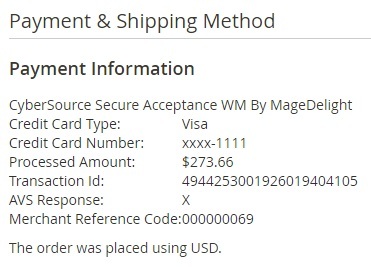 That was all you need to know about the backend interface of the Magedelight CyberSource Secure Acceptance Magento 2 payment gateway module. Now, we are going to explore the frontend section of the extension. In a customer account all saved credit cards are gathered under the Cybersource(My Saved Card) tab. You can view card number and other information. Each card can be edited or deleted. To add a new card, specify first and last name, email, company, street address, city, state/province, zip/postal code, country, and telephone. Next, fill in the Card Information form: credit card type, credit card number, and expiration date. 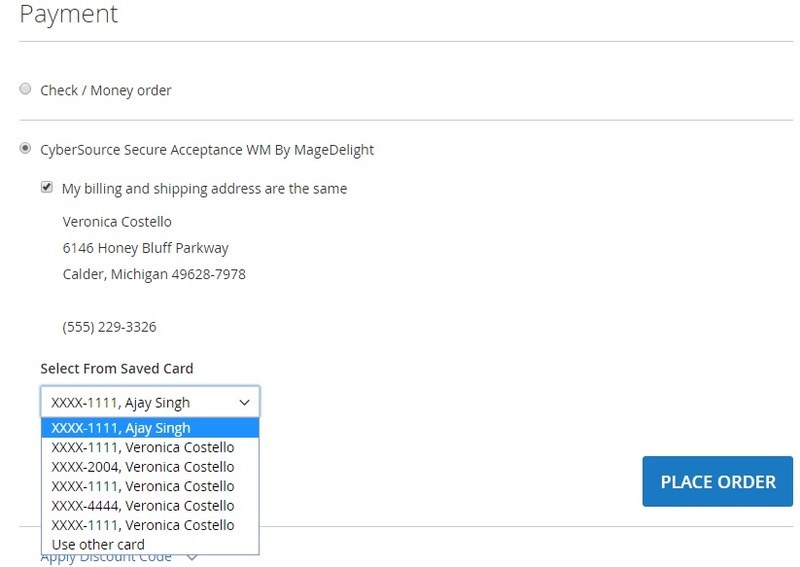 While on a checkout page, select CyberSource Secure Acceptance WM By MageDelight, if your billing and shipping address are the same tick the appropriate option, and select a credit card from saved cards. Hit the Place Order button. Now, the algorithm mentioned in the beginning of this post starts to work.